Spain is a nation of football fanatics, so you do not have to worry about not finding a place to watch the World Cup 2018 in Barcelona. Where can you watch the event in Barcelona? Everywhere! There will be large screens in bars, pubs, restaurants, and cafes in Barcelona during the World Cup. But, if you want to watch the matches in a sports bar, the most famous in all of Barcelona is Sports Bar Rambles, a sports bar with 16 big screens available. This is located in the heart of Barcelona, so it is easy to find. 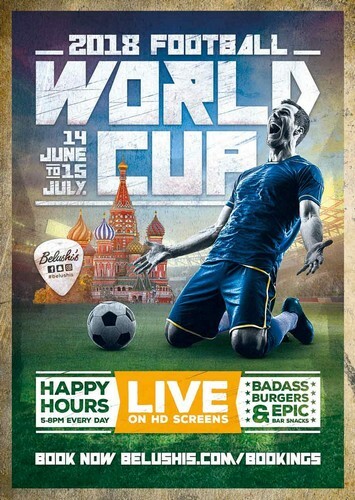 There are several other bars in Barcelona suitable for watching the World Cup as well. Here are some great bars worth considering. The Fifa World Cup will be broadcasted by Telecinco and Cuatro in Spain. These are free TV channels, meaning that you can just turn on the TV in your hotel room to watch the matches as well. You can also watch them online at their websites. If you do miss some English commentators, you can read more about how to stream the FIFA World Cup online on BBC/ITV in the UK in this article. You can also find a full FIFA World Cup schedule here. Spain will play their first match of the tournament already on June 15th (second day), and they will play against Portugal on this day. This is one of the most interesting group-stage matches during the tournament, so make sure to arrive in time if you want a good chair in a sports-pub in Barcelona if you want to watch this match. It will also be interesting to follow the event for the people of Barcelona, as lots of FC Barcelona players will play during the tournament. Lionel Messi will play for Argentina, while Luis Suarez will play for Uruguay. There will be other players active as well, but these are the two biggest stars playing for other countries during the tournament.